y the sixteenth century, Nunavut had been a homeland to more than 20 generations of Inuit. 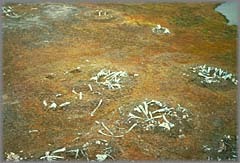 Their ancestors had moved into the area from Alaska about 1000 A.D., and had built a secure way of life on the animal resources of the Eastern Arctic. 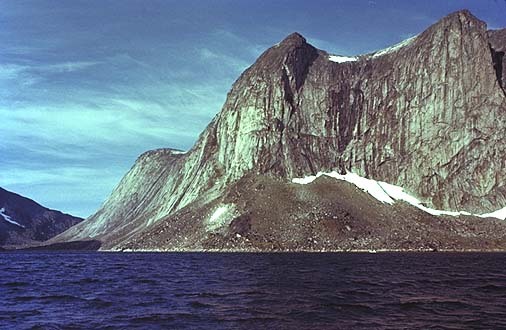 For 500 years, Inuit had occasionally met and traded with the people they called qallunaat: explorers and merchants from Norse Greenland, and in more recent times, European explorers, fishermen and traders. 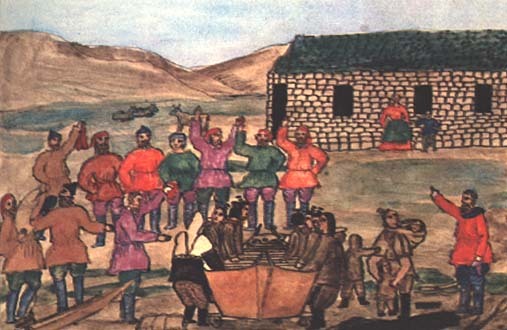 Painting by the 19th century Greenlandic artist Aron of Kangeq, illustrating Inuit historical accounts of meetings with the Norse. 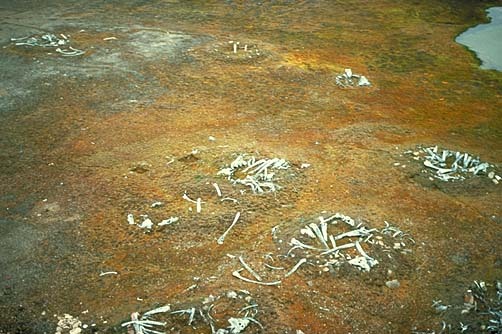 The remains of ancient Inuit settlements are scattered across Nunavut. To sixteenth century Europeans, the Arctic was a place of fabulous marvels. Perpetual daylight illuminated a land that mysteriously attracted the needle of the compass, and from which occasional travellers brought strange tales, the skins of great white bears and the horns of unicorns. "...here vnder and aboute the Pole is beste habitation for man, and that they euer haue continuall daye, and know not what night or darkenesse meaneth." When Martin Frobisher's crew found the body of a narwhal on a Baffin Island beach, they tested its magical powers and declared it to be a unicorn. "On this West shoare we found a dead fishe floating, whiche had in his nose a horne streight and torquet, of lengthe two yardes lacking two ynches, being broken in the top, where we might perceiue it hollowe, into which some of our Saylers putting Spiders, they presently dyed. I sawe not the tryall hereof, but it was reported vnto me of a trueth: by the vertue whereof, we supposed it to be a sea Unicorne."